The date has been set for 2015 sheep shearing! I am curious (and nervous) to see how the fleeces look after the winter hay feeding season. Especially, with this being our first year feeding round bales. There is always some VM (vegetable matter) but how much, that is the question. When a sheep shearer visits a farm, more times than not, they take the wool with them, which then gets taken to a wool pool where it is sold. The picture above was taken at a friends farm, during shearing day. I helped him sort fleeces-wool to send along with the shearer and ones that could be kept to sell/use. This was the first time, that he considered keeping any of his fleeces. Why? Because a lot of people who raise sheep do not raise them for wool, and do not consider the wool worth anything. We keep all of our wool, which often leads to the question, what do you do with it? 1. I use it! One of the benefits of raising sheep is that I always have a wool stash, which can be used for handspinning into yarn, which then can be used for knitting or crocheting into useful items. It can also be felted. You can keep yourself busy with fiber crafts and never get bored! 2. We process it. We are set up to make wool roving and small batts. 3. Some of the wool is sorted and sold as is. Border Leicester's fleeces have lovely curly locks. 4. Send it to a larger mill, to be made into larger wool batts, that we can use to make bedding products. I love working with wool. I know many sheep farmers would not agree with me, and would rather use their wool as compost (yes, another use for wool) than lift a finger to do anything with it. But come April I will be knee deep in wool and enjoying (almost) every minute of it! 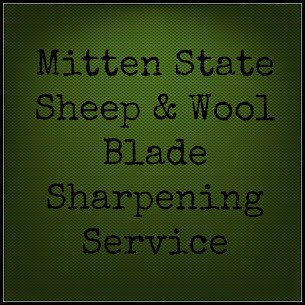 If you have some wool fleeces, and not quite sure where to start, here are some links to some previous post about skirting, washing, etc.. I'd use it too, if I had it. This is very helpful to anyone who is even interested in it. Thanks for sharing. Love it you know I love this! Great post!